GREELEY, Colo. — Junior Quinton Upshur netted a career-high 32 points against Northern Colorado, but it wasnât enough as Northern Arizona (8-10, 5-2 Big Sky) fell to the Bears 87-72 in a battle of the top teams in the Big Sky. 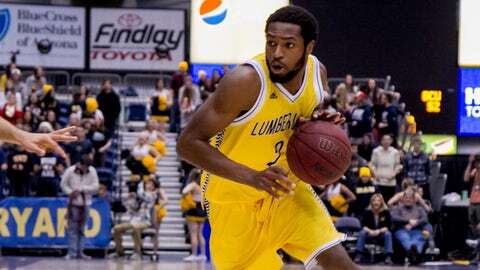 The loss snapped the Lumberjacksâ four-game win streak. The first half was a scoring spree for both teams. NAU shot 50 percent from the floor, led by 23 points from Upshur who went 9-for-10 from the field. Upshur scored 15 straight points for NAU midway through the first half to carry the NAU offense, but the Jacks turned the ball over 11 times. The Bears (12-4, 6-1 Big Sky) garnered most of their offense from Tate Unruh and Derrick Barden, as UNC took a 42-29 lead into the locker room. Both teams came out of the half with as much energy as they had in the first. NAU had four different players score the first nine points of the second half to get the ball moving. The Bears were able to take control of the game as they went up by as many as 22 points with 8:16 remaining. The Jacks outscored the Bears 14-7 in the final five minutes of play, but UNC used the energy of the home crowd to come away with the win. Freshman Kris Yanku recorded a career-high 20 points (5-for-7) for NAU, as the Jacks shot 53.2 percent for the game. Unruh finished with a team-high 20 points (5-for-7), all from long range. Tim Huskisson scored 19 points, while Barden added 14. Tevin Svihovec chipped in 11 points. The Bears shot 59.3 percent in the victory, including 11 made 3-pointers.